Rank Group who own the Grosvenor Casinos chain bought Gala's UK land-casinos and as a consequence, the Gala Barracuda casino is now the Grosvenor Barracuda casino. So when you head to 1 Baker Street (yes, THAT Baker Street) in the heart of London, looking for a Gala casino, don't do what I did and look for the Gala logo as it's obviously been replaced. So I walked up and down for about 15 minutes before asking someone who pointed across the road at the entrance and looked at me like I was an idiot. Which I was...at that moment anyway! But hey ho, moving on! So we all know that new owners can mean a bit of a transition period but the Barracuda apparently hasn't really changed and still offers the same facilities. It has a nice informal yet quite up-market feel to it but is pretty typical of UK casinos. A low ceiling and columns throughout the venue gives it a very nice feel when you walk through and everything flows together from the bar, across the gaming the floor and onwards to the restaurant. The interior of the casino has a dark carpet with golden swirls as patterns. The walls are lit up by strong lighting and the layout is quite interesting. With that said - it is likely that there might be some major changes to the interior within the next few months. This all depends on how Grosvenor feel about branding more of the casino based on their own name. But for now it is an excellent casino location where you can enjoy a variety of good games. The gambling floor at the Barracuda is pretty much what you'd expect. The atmosphere was quiet when I was there but it is quite spacious. As a result, they have been able to spread out the electronic machines around the roomand while you often find your back towards the rest of the room when you are playing slots and electronic roulette, here the machines are turned sideways so it is like a massive conga line all around! It might not seem like a big thing but it makes you feel like you are more involved in the casino itself. In terms of the other games there are several roulette tables spread across the floor, joined by Blackjack tables, a Brag tablee, a Punto Banco table and 3-Card Poker. These basic table games are accompanied by the aforementioned electronic roulette machines and obligatory 20 slot machines, most of which are multi-game (IGT + Novoamtic when I was there). 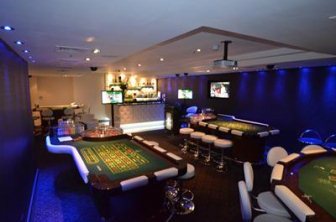 The one thing that the Baraccuda Casino does lack is a dedicated Poker room although this review was written soon after the take-over and Grosvenor may well have added one by now. The restaurant at the Barracuda has an ideal position in the venue. It is slightly raised at the end of the gaming floor with a small barrier to separate it from the rest. This is a really nice feature that allows you to keep an eye on the action when you eat. But if you want peace and quiet the location might not be as ideal. Food in this restaurant is served during day and night time and you will find a mixture of traditional English food as well as some more international dishes to literally spice things up. It is a decent restaurant with nice service to compliment your gambling experience. If you are a bit tired of the full dining experience you can just head to the bar area and get "Bar Snacks". If you've ever been at a Grosvenor casino you will know that this means pizzas, burgers, pastas and salads. The bar is also up to the Grosvenor standard. It has a really nice and welcoming layout and once the drinks starts flowing it is the place to be. The wine list is extensive, the cocktails are delicious and you can find beer, champagne and a wide range of spirits here too. With the change in ownership of the casino it is hard to put a finger on events and tournaments this early on. Grosvenor are usually quite generous and have regular events for loyal customers and newcomers. We are expecting them to dish out the same type of generosity at the Barracuda location but as of yet we are not sure exactly what they will offer. But be sure to check out their website on a regular basis to find out what is on and stay updated with the latest promotions. Well, if the fact that the casino is located on the same street as where the legendary Sherlock Holmes lived is not enough I am sure we can think of a few more reasons. The gambling floor is extensive and the positioning of machines around the walls does make a huge difference for the overall feel and experience. The food is good, the snacks are even better and the drinks take the prize as the top refreshment of the venue. The uncertainty of what will happen with the new ownership should not scare you off either - Grosvenor always offers top service and great games no matter what they have planned. With opening hours of 24 hours a day, seven days a week you can always get your gamble on at Grosvenor Casino Barracuda.